Theron Thomas (left) & Timothy Thomas of R. City. Now in 2015, the Thomas brothers are also establishing themselves as hit artists. They’ve signed a label deal with hitmaker Dr. Luke’s Kemosabe Records, which is via RCA Records. Their first single “Locked Away” (featuring vocals by Adam Levine of Maroon 5) is currently a Top 10 hit on the Billboard Hot 100 chart, and it’s a hit in many other countries. R. City will be releasing their debut album, titled What Dreams Are Made Of, on October 9th. This album vibrantly showcases R. City’s unique sound, which blends hooky pop melodies, hip-hop and a Caribbean flavor. Originally from St. Thomas in the Virgin Islands, the Thomas brothers started out as artists and built a large following, with sold out shows and independent releases. “Growing up, we were artists first, and we would perform shows around the islands,” recalled Theron Thomas. “After high school, we moved to the U.S. For awhile, it was your typical struggling artist story—we worked regular jobs. “Our first break came as songwriters, when we were in the studio with Akon’s DJ, Benny D. We played him a song and Benny said, ‘Yo, that song is dope, and it fits for Akon.’ At the time, we thought artists (mostly) wrote their own songs and we didn’t think we could get cuts writing for other artists. But then Benny played it for Akon and he loved it and cut it. We got paid $5,000 for that song—that was our way in the door (as songwriters). Then things started to happen and we got cuts with Rihanna and Miley Cyrus. It wasn’t long before the Thomas brothers (then known as Rock City) had a flurry of hits. In addition to co-writing hits for Cyrus, Sean Kingston and the Pussycat Dolls, the duo co-wrote hits for Rihanna (“Pour It Up”), Becky G (“Shower”), Nicki Minaj (“Only”), Usher (“I Don’t Mind”), and Mike Will Made It (“23”). They’ve also had cuts with Justin Bieber, Beyonce, Kanye West, Iggy Azalea, R. Kelly, Leona Lewis, Janet Jackson, Nicole Scherzinger, Jennifer Hudson, Kelly Rowland, Ludacris, T.I., Ciara, Omarion, B.o.B., Fergie and other artists. 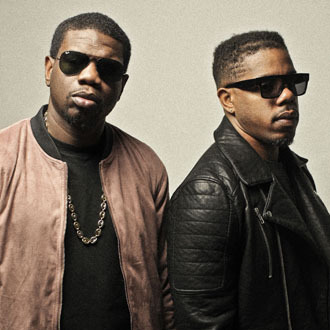 R. City is now off to an excellent start, scoring a Top 10 pop hit with their debut single, “Locked Away” (featuring Adam Levine, who sings the choruses). The song’s lyric theme is based on a true story which the Thomas family experienced. “It’s a personal one, because our dad was locked up for about six years,” explained Timothy. “Our mom held him down the whole time. There’s a different side of the song as well…it shows that real love. Thomas & Timothy Thomas, and featuring vocals by Adam Levine.